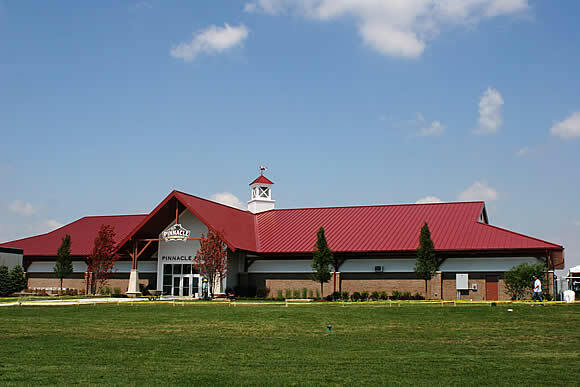 Pinnacle Race Course is a thoroughbred horse racing track located in Huron Township, Michigan, southwest of Detroit off of Interstate 275. The track is just south of the Detroit Metro Airport. The track opened on July 18, 2008. The track was rushed into operation in the summer of 2008 to replace Muskegon's Great Lakes Downs on the Michigan racing schedule. Magna Entertainment Corporation closed Great Lakes Downs in November 2007 after years of financial losses. The track has a one-mile dirt oval, with plans to build a 7/8-mile turf course by 2010. The track opened with a 1,000-seat temporary grandstand, with a 4,000-seat permanent grandstand expected to be complete by 2010.